I am so excited The Little Unicorn Popup Shop with The Baby Cubby! Come and enjoy an after hours party with exclusive pre-sale items from Little Unicorn and gorgeous teepees from Tnees Tpees! This ladie’s night will be filled with amazing deals, delightful sodas, and mouthwatering desserts courtesy of The Baby Cubby! You may also get the chance to meet Courtney from Tnees Tpees! 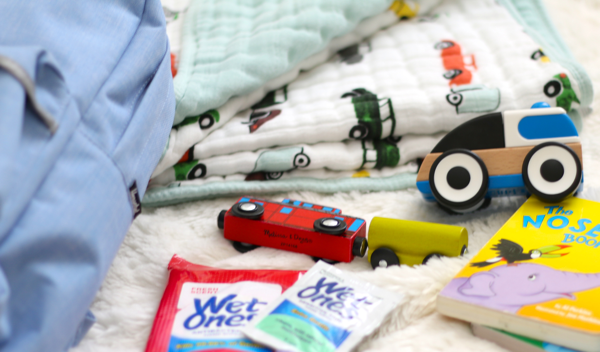 Where: The Baby Cubby Store – Click HERE for directions! Photo booth with props to record your epic shopping deals and begin your own Hearts of Gold Project! Delectable desserts to keep you satisfied during your shopping extravaganza! Tnees Tpees as low as $120!! Get your first looks (and buys) of Little Unicorn’s new designs and prints – exclusive to this pop up shop! 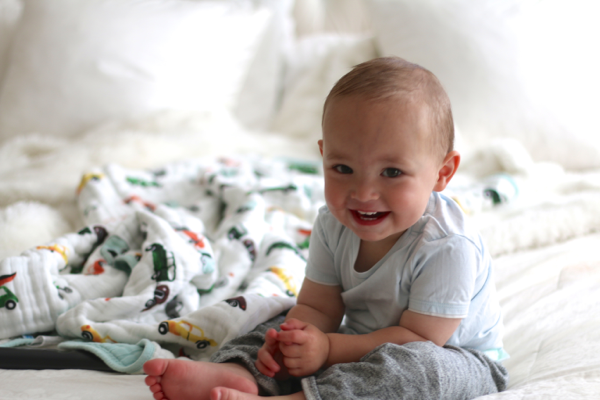 10% OFF your entire Baby Cubby purchase including closeout sale items! If you don’t come for the food or the fabulous sales, you at least need to come to be entered in for our amazing giveaways! Follow us on Instagram for the BIG giveaway which will include something special from all three shops! If you’re actually in store be prepared for 6 different giveaways every half hour! 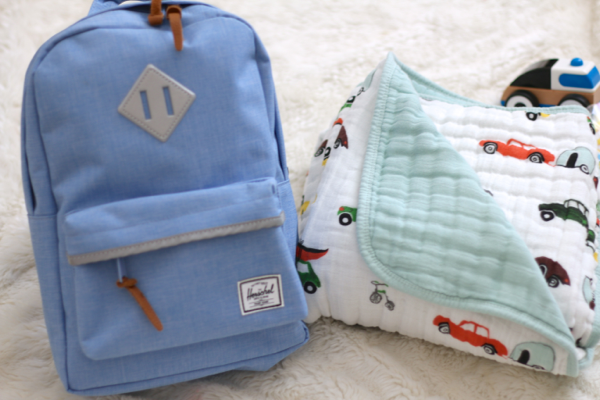 Little Unicorn’s new diaper bags and swaddles! 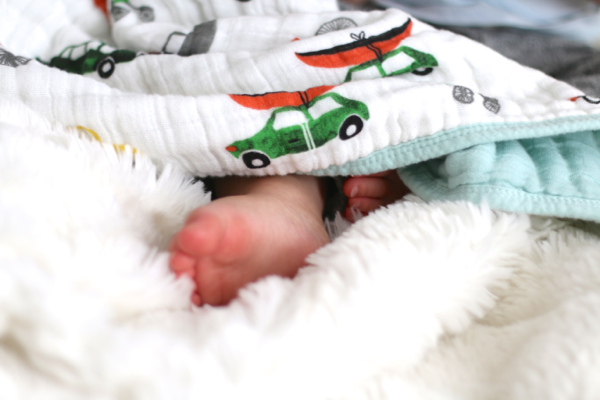 Blankets are one of those things that have to be just right in our home! 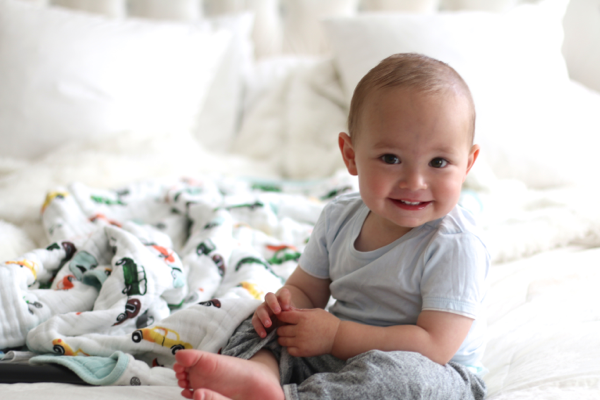 My little boy, Mason, LOVES anything soft & cuddly but is very particular about his blankets. It’s so cute but can be a bit of a pain at times. He also loves to put his little fingers through the tags, it’s a little security thing. 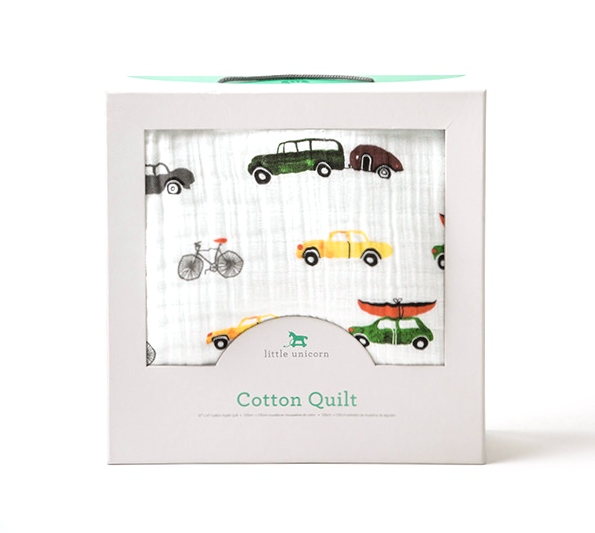 Every time he falls asleep you will see his little fingers poking through..
We are IN LOVE with this oversized Muslin Cotton Quilt from Little Unicorn! 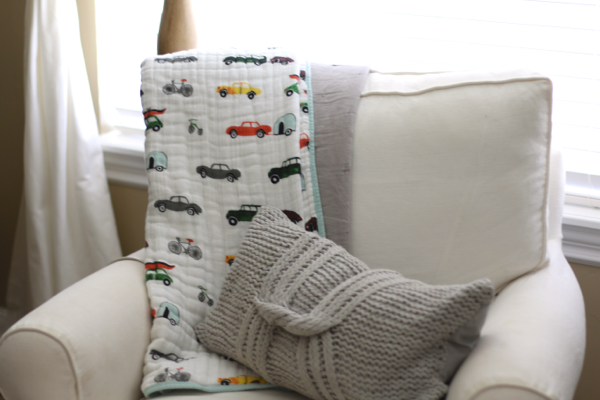 We have the “Traffic Jam” Quilt right here. 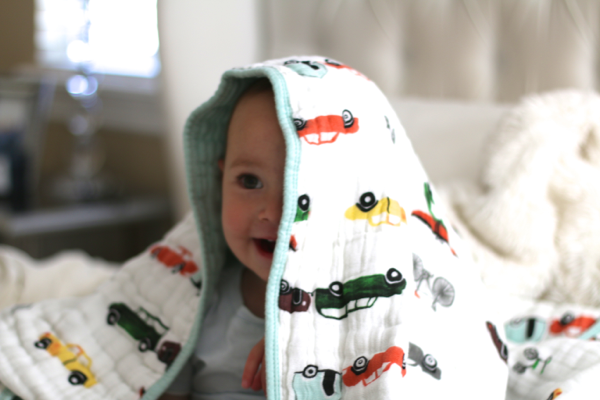 It’s not your average Muslin Blanket. It has 4 layers of Muslin Cotton which are quilted together. 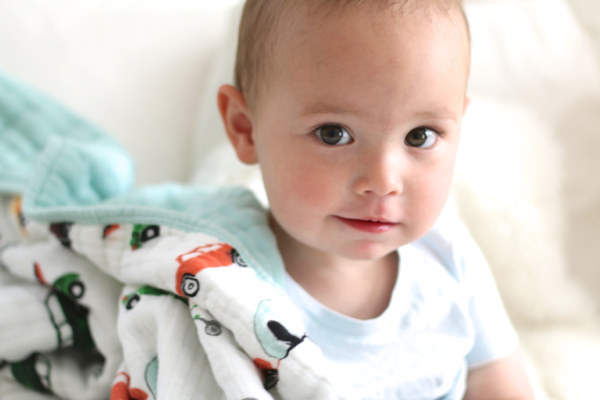 It’s great for babies of all ages because it is heavier for a warm & cozy cuddle but still breathable for little infants. Mase is now 20 months but I would feel perfectly comfortable putting it in his crib when he was a newborn! 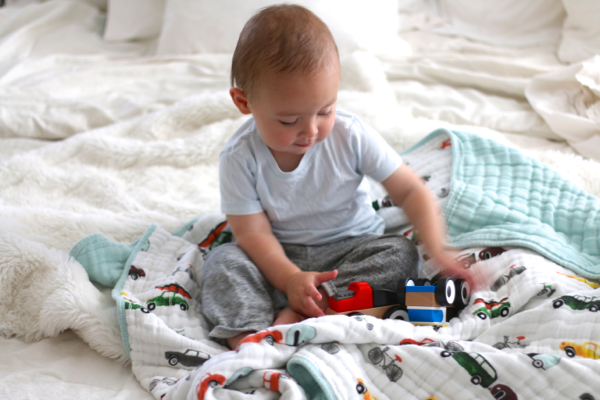 It is a fabulous blanket at home & to travel as well! They have 6 unique patterns. I love the prints they have because you don’t see them everywhere. They would also be a wonderful gift! 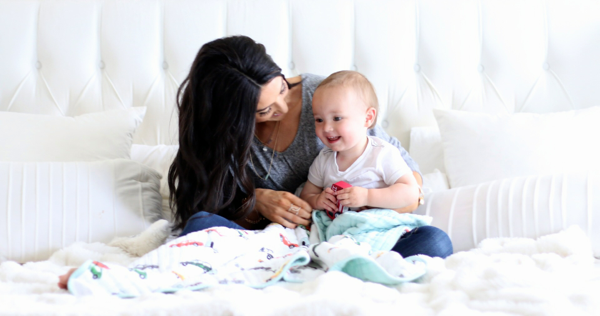 They also carry Plush Blankets, Swaddle Blankets, Darling Diaper Bags and many more items! I have fallen in love with this shop! We always want to give our little ones the best and Little Unicorn surly delivers!